Looking for a new challenge now that you ve mastered sudoku? 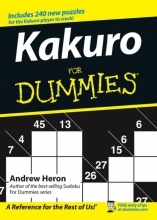 Kakuro might be just what you need, and Kakuro For Dummies is a great place to start! A kakuro puzzle is a grid consisting of interlocking horizontal rows and vertical columns of squares, called blocks. Part 1: Getting to know Karkuro. Part III: The answer to your problems.